P-glycoprotein (Pgp) and vaults are associated with multidrug resistance in tumor cells, but their physiological functions are not yet clear. Pgp, the prototypical transmembrane transporter molecule, may also facilitate the migration of skin dendritic cells (DC). Vaults—ribonucleoprotein cell organelles, frequently overexpressed in Pgp-negative drug-resistant tumor cells—have also been associated with intracellular transport processes. Given the pivotal role of DC in dealing with exposure to potentially harmful substances, the present study was set out to examine the expression of Pgp and vaults during differentiation and maturation of DC. DC were obtained from different sources, including blood-derived monocytes, CD34+ mononuclear cells, and chronic myeloid leukemia cells. Whereas flow cytometric and immunocytochemical analyses showed slightly augmented levels of Pgp, up-regulation of vault expression during DC culturing was strong, readily confirmed by Western blotting, and independent of the source of DC. In further exploring the functional significance of vault expression, it was found that supplementing DC cultures with polyclonal or mAbs against the major vault protein led to lower viabilities of LPS- or TNF-α-matured monocytes-DC. Moreover, expression of critical differentiation, maturation, and costimulatory molecules, including CD1a and CD83, was reduced and their capacity to induce Ag-specific T cell proliferative and IFN-γ release responses was impaired. These data point to a role for vaults in both DC survival and functioning as APC. Dendritic cells (DC)3 are recognized as major players in the regulation of immune responses by directing both their vigor and quality. The ability of DC to activate naive T cells depends on their maturation state. Immature DC are mainly distributed in tissues interfacing with the external environment where they can capture and process Ags with high efficiency. After Ag internalization, DC leave the peripheral tissues to reach the draining lymphoid organs. During this migration, DC undergo maturation, involving augmented surface expression of MHC, chemokine receptors and costimulatory molecules, and acquire the ability to prime T cells (1). It was only recently that P-glycoprotein (Pgp), a molecule well known for its ability to transport a broad spectrum of xenobiotics out of cells and thereby induce multidrug resistance (MDR) (2), was identified as yet another molecule that might play a role in this migratory process (3). Since the putative contribution of Pgp and, possibly, other mechanisms defined earlier in drug resistance studies, to DC functioning is still unknown, we set out to further explore this issue. Notably, immune responsiveness might well benefit from such mechanisms. To preserve their sentinel function in immune responses, DC should not readily suffer untoward damage from exposure to potentially toxic materials, as often derived from microbial and environmental sources. Hence, the expression of Pgp and a newly discovered cell organelle, the vault, was studied during in vitro DC development from various peripheral blood-derived precursor cells (4, 5). Vaults are evolutionarily highly conserved, large ribonucleoprotein particles (6). The particles represent multimeric RNA-protein complexes with one predominant component, the major vault protein (MVP). Although the cellular role of vaults has remained elusive, several findings support the view that vaults have a transport function by acting as a carrier, mediating bi-directional nucleo-cytoplasmic exchange as well as vesicular transport of compounds, including cytostatic drugs (7, 8, 9, 10, 11, 12, 13, 14). The present results demonstrate that not only Pgp but also vaults are expressed and up-regulated during the differentiation and maturation of DC from various sources. Furthermore, endocytosis of anti-MVP Abs leads to reduced viabilities and interference with DC maturation and Ag-presenting capacity, thus pointing to a critical role of vaults in DC functioning. Human peripheral blood mononuclear cells isolated by adherence to plastic were (either upon cryopreservation or directly) cultured in IMDM (10 × 106 cells/2.5 ml) containing 25 mM HEPES (BioWhittaker, Verviers, Belgium), 10% FCS (Integro, Zaandam, The Netherlands), 2 mM l-glutamine (Life Technologies, Paisley, U.K.), 50 IE/ml sodium-penicillin G, 50 μg/ml streptomycin sulfate, and 50 μM 2-ME (Merck, Darmstadt, Germany) (complete medium) supplemented with 100 ng/ml rGM-CSF (Leucomax, Sandoz, The Netherlands) and 1000 U/ml rIL-4 (CLB, Amsterdam, The Netherlands). After 6 days of culture, a semiadherent cell population was obtained which displayed a veiled DC morphology. These immature DC were subsequently cultured for 1 day in the absence or presence of either LPS (25 ng/ml, Escherichia coli; Difco, Detroit, MI) or rTNF-α (50 ng/ml; Eurocetus, Amsterdam, The Netherlands) to induce maturation before harvesting. Loosely adherent cells were harvested with 0.5 mM EDTA/PBS. Cultures set up for studying vault functions were performed with anti-vault Abs added to the culture medium at the onset, day 4, and day 6 of MO-DC cultures. Each time the amount of administered Abs was set on 5 μg/ml. Polyclonal Abs used were rabbit anti-MVP pabW (15) and rabbit IgG (normal rabbit serum; DAKO, Glostrup, Denmark). mAb experiments were performed with mouse (LRP-56 and MVP-9) and rat (LMR5) mAbs against MVP, respectively, irrelevant control mouse and rat mAbs produced in our laboratory (16, 17). These Abs were dialyzed before use (Slide-Alyzer Cassette; Pierce, Rockford, IL). DC were generated from CD34+ cells isolated from peripheral blood of G-CSF-mobilized patients. Cells bearing CD34 Ag were isolated from mononuclear fractions through positive selection by mini-MACS using the CD34+ progenitor cell isolation kit according to the manufacturer’s recommendations (Miltenyi Biotec, Bergisch Gladbach, Germany). CD34+ progenitors were cryopreserved or seeded for expansion at 105 cells/ml in complete medium in the presence of rGM-CSF (100 ng/ml) and rTNF-α (2.5 ng/ml) for 14 days before harvesting. Adherent cells were recovered using 0.5 mM EDTA/PBS. PBMC from CML patients were (either upon cryopreservation or directly) seeded in a 2 × 106 cells/ml concentration and cultured in complete medium supplemented with rGM-CSF (100 ng/ml), rTNF-α (2.5 ng/ml), and rIL-4 (1000 U/ml) for 10 days. These immature CML-derived DC were subsequently cultured for 3 days in the absence or presence of LPS (25 ng/ml) to induce maturation. Loosely adherent matured cells were harvested with 0.5 mM EDTA/PBS. The drug-sensitive non-small lung cancer cell SW-1573 and its Pgp overexpressing multidrug-resistant, doxorubicin-selected (160 nM) subline SW-1573/2R160 (18) and the drug-sensitive small lung cancer cell line GLC4 and its MVP/vault overexpressing multidrug-resistant, doxorubicin-selected (1152 nM) subline GLC4/ADR (19) were used as controls for the immunoreactivity of the specific anti-Pgp protein and anti-vault protein Abs. The drug-selected cell lines were cultured in the presence of doxorubicin every other week and propagated in DMEM (BioWhittaker) supplemented with 10% FCS, 50 U/ml penicillin G, and 50 μg/ml streptomycin. Immunophenotypical analysis of blood precursor cells and DC was performed using unlabeled mAb and mAb directly conjugated to FITC or PE. These included anti-CD83/PE (Immunotech, Marseille, France), anti-HLA-DR/FITC, anti-CD80 and anti-CD80/PE, anti-CD14 and anti-CD14/FITC (BD Biosciences, San Jose, CA), anti-CD86/PE, anti-CD54PE, anti-CD1a/PE (BD PharMingen, San Diego, CA), anti-CD86 (Ancell, Bayport, MN), anti-CD1a and anti-HLA-DR (Monosan; Sanbio, Uden, The Netherlands). For immunophenotypical evaluation of Pgp, MVP and p193 expression, next to the unlabeled MVP-specific mAbs mentioned above under MO-DC culturing, the anti-MVP specific mAb MVP-37 (17) was used, as well as the following mAbs: anti-p193 mAb p193-4 (15), respectively, anti-Pgp mouse mAbs JSB-1 (20) and C494 (21) (Centocor, Leiden, The Netherlands), both recognizing internal epitopes, and MRK16 (22), UIC2 (23), 4.17 (24), and 4E3 (25) directed against extracellular epitopes. Except for the latter five Pgp-specific mAbs, all other mAbs mentioned were produced in our laboratory. Negative isotype-matched control murine mAbs were included in every experiment. Cells were washed in PBS supplemented with 0.1% BSA and 0.02% NaN3 and either fixed and permeabilized with 2% formaldehyde in acetone for 10 s (intracellular epitope detection) or stained directly after harvesting (extracellular epitope detection). Cells were preincubated for 20 min with normal goat serum followed by incubation for 45 min with primary mAb. Binding of unlabeled mAb was revealed by FITC-conjugated goat anti-mouse Ig (CLB). Fluorescence analysis was performed on a FACScan flow cytometer after acquisition of 10,000 events (BD Biosciences). Results were expressed as mean fluorescence indices (MFI) calculated as the ratio between the mean fluorescence of the specific mAb and the mean fluorescence of the negative control Abs. Cytocentrifuge preparations of cells were air dried, fixed at room temperature in acetone for 10 min, or, in the case of the mAbs MVP-9, MVP-37, and p193-4, in 3% (w/v) paraformaldehyde/0.4% (w/v) glucose in PBS for 10 min. Further immunocytochemical staining procedures were performed as described before (15). In addition, biotinylated swine anti-rabbit Ig and streptavidin-biotin-peroxidase complexes (DAKO) were used. Cytospins were scored by two independent observers. Postnuclear supernatants from MO-derived mature DC and control cells lines SW-1573/2R160 and GLC4/ADR were prepared and analyzed by immunoblotting following procedures as described previously (15). Cells were incubated in culture medium containing 2 μM daunorubicin (DNR; Sigma-Aldrich, St. Louis, MO) for 60 min at 37°C, washed in ice-cold medium, and resuspended in medium without or with 2 μM PSC833 (Novartis, Basel, Switzerland) or 10 μM verapamil (VER; Sigma-Aldrich). After 60 min of incubation at 37°C, cells were washed and immediately placed on ice for analysis by flow cytometry. Results were calculated as the ratios between the mean fluorescence of DNR retention in the presence of Pgp inhibitors and the mean fluorescence of DNR retention in the absence of Pgp inhibitors (dye fluorescence index (DFI)). For double-labeling experiments, cytospin preparations of immature and mature MO-DC were fixed for 2–4 min in methanol (−20°C) or 10 min in acetone at room temperature. After a blocking step with normal goat serum (DAKO) for 20 min at room temperature, the cells were incubated simultaneously with anti-MVP (mAb MVP-9 on methanol-fixed spins or LRP-56 on acetone-fixed spins) and rabbit polyclonal Abs against TGN-46 for labeling the trans-Golgi network, CD63 for labeling lysosomes, MHCI or MHCII diluted in PBS/0.5% BSA for 60 min at room temperature. All rabbit polyclonal Abs were kindly provided by J. Neefjes and M. Fernandes Borja from the Dutch Cancer Institute (Amsterdam, The Netherlands). Subsequently, anti-MVP mouse mAb binding was detected using FITC-labeled goat anti-mouse Ig (DAKO), and the binding of rabbit polyclonal Abs was detected with Texas Red-labeled goat anti-rabbit Ig (Molecular Probes, Eugene, OR) (simultaneous incubation for 30 min at room temperature). Cells were mounted with Vectashield (Vector Laboratories, Burlingame, CA). Cells were examined with a MRC-600 confocal microscope (Bio-Rad, Herfordshire, U.K.), coupled to a Nikon microscope (Melville, NY). Negative controls consisted of simultaneously processed slides replacing either the mouse mAb LRP-56 and MVP-9 with isotype-matched control mAb (mouse IgG2b, anti-chromogranin A; DAKO) or replacing the rabbit polyclonal Abs with control polyclonal (anti-calcitonin; DAKO). For each condition, at least 50 immature and mature DC were evaluated for resulting staining patterns. After 7 days of culture, viable LPS-matured MO-DC were seeded as stimulator cells in round-bottom 96-well culture plates (Nunclon International, Roskilde, Denmark) at 104 viable (trypan blue exclusion) DC per well and pulsed for 2 h with 1 μg/ml influenza viral Ag preparation containing three major hemagglutinins as outlined elsewhere (26). After discarding the supernatant, 250 μl of fresh medium and 50 μl with 105 autologous PBL were added per well. Cells were cultured for 6 days, after which 50 μl of supernatant was collected for IFN-γ assays by ELISA, and [3H]thymidine was added (0.4 μCi/well; Amersham, Aylesbury, U.K.), after which the cells were harvested onto fiberglass filters and [3H]thymidine incorporation was determined using a flatbed liquid scintillation counter (Wallac, Turku, Finland). Immature and LPS- and TNF-α-matured DC were differentiated in vitro from peripheral blood MO. Using this model, first Pgp and MVP expression were analyzed by flow cytometry. Development of MO-DC was monitored by phenotyping the cells at the different stages in culture. Characteristically, expression of the MO marker CD14 expression was lost, whereas the DC differentiation marker CD1a was up-regulated (Fig. 1⇓A). Expression of other DC differentiation markers (CD80, CD86, and HLA-DR) was also up-regulated (data not shown), and there was de novo expression of the DC maturation marker CD83 (Fig. 1⇓A). 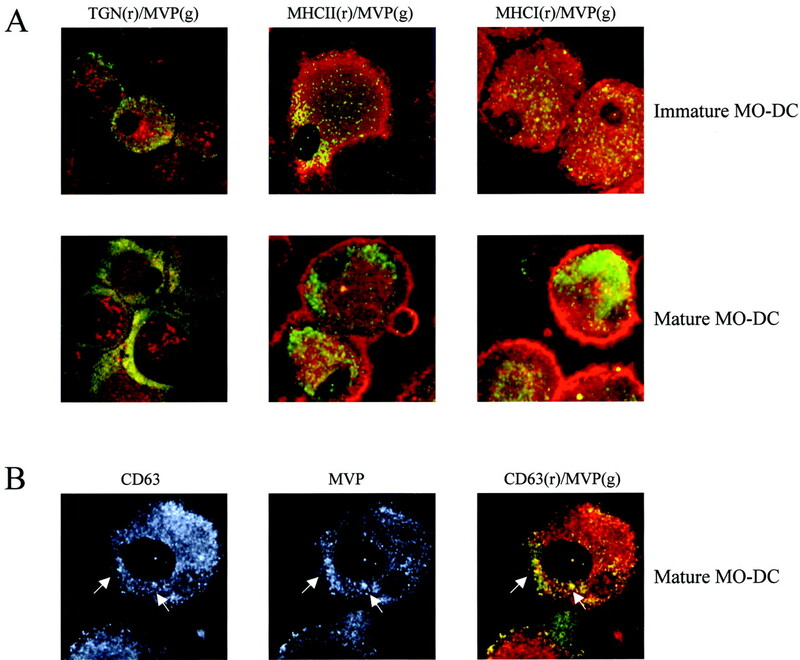 Immunolabeling of permeabilized cells with mAb directed against intracellularly situated epitopes of Pgp (mAb JSB-1) and MVP (mAb LRP-56 and MVP-9) revealed neither of the proteins in the CD14+ MO. Immature MO-DC displayed weak expression of Pgp (MFI, 1.6), which was slightly increased in fully matured MO-DC (MFI, 1.8). Clear MVP expression was found in immature MO-DC (MFI, 1.9), which was further increased in fully matured MO-DC (MFI, 4.3; Fig. 1⇓A). Pgp and vaults are up-regulated during MO-DC differentiation. A, Flow cytometric evaluation of MO, immature MO-DC, and LPS-matured MO-DC using anti-CD14, CD1a, and CD83 for immunophenotypical analysis and the mAbs JSB-1 and LRP-56 for Pgp and MVP detection, respectively. B, Immunocytochemical detection of Pgp (JSB-1), MVP (LRP-56), and the minor vault protein p193 (p193-4) in cytospin preparations of MO, immature MO-DC, and mature (LPS) MO-DC. C, Western blot analysis of MVP (using mAb MVP-37) levels in postnuclear supernatants of control tumor cell lines, MO, and mature (LPS) MO-DC. 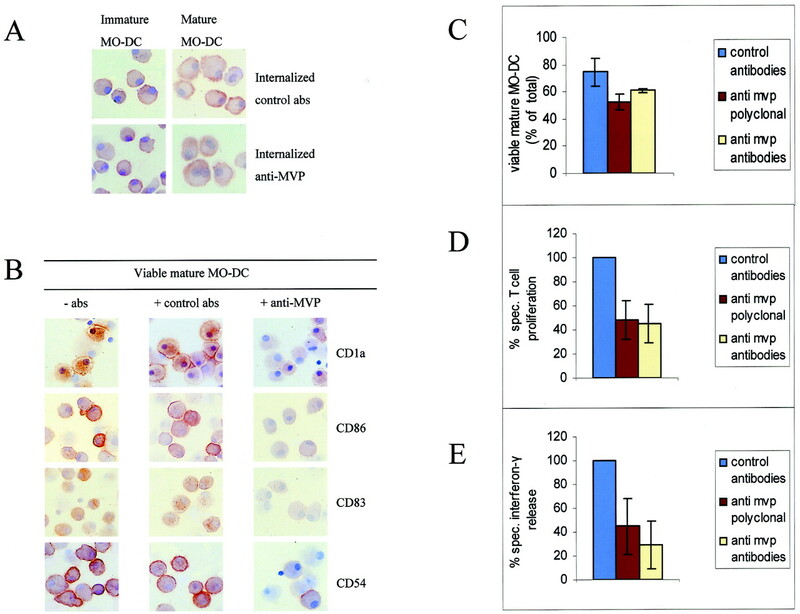 Immunocytochemical analysis of cytospin preparations confirmed these findings, i.e., low, but distinctly augmented levels of Pgp and robust up-regulation of the MVP protein during the differentiation and maturation of MO-DC (Fig. 1⇑B). With two anti-Pgp mAbs, JSB-1 and C494, we observed cytoplasmic immunoreactivity, sometimes in mature MO-DC associated with the plasma membrane. Three different anti-MVP mAbs, i.e., MVP-9, MVP-37, and LRP-56 (shown in Fig. 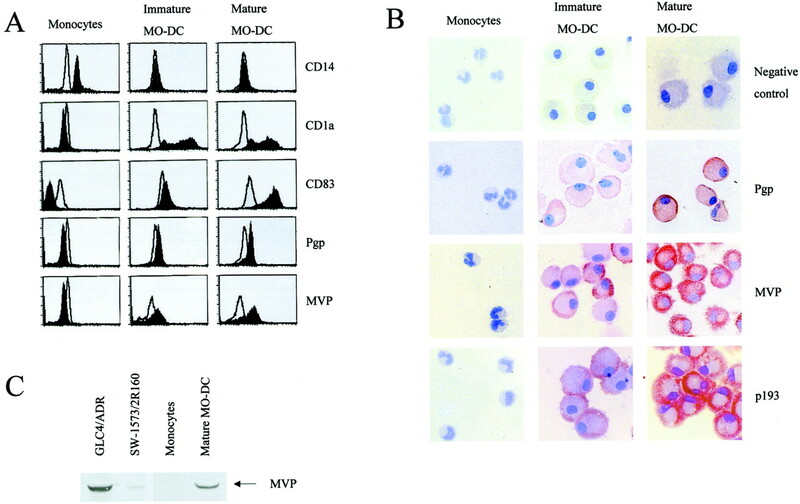 1⇑B) displayed the characteristic coarsely granular cytoplasmic staining of MVP, which was significantly increased in fully mature MO-DC as compared with immature MO-DC. In addition, both immature and mature MO-DC showed parallel overexpression of MVP and a minor vault component, the 193-kDa minor vault protein (p193), indicating that whole vault particles are up-regulated during MO-DC differentiation and maturation (15). To further establish overexpression of Pgp and MVP molecules in mature MO-DC, postnuclear supernatants were prepared and immunoblotted by using anti-Pgp mAb C494 and anti-MVP mAb MVP-37. Although a protein band of ∼170 kDa was readily detectable in the control postnuclear supernatant of Pgp-positive SW-1573/2R160 tumor cells, no Pgp could be identified in mature DC, indicating that the expression level of Pgp in mature MO-DC remains below the level of detection by Western blotting (data not shown). High levels of MVP in mature MO-DC were confirmed by Western blotting; a clear band of ∼110 kDa was detected, corresponding to the molecular mass of MVP (Fig. 1⇑C). In vitro, DC-like cells can be generated from a number of sources by culturing hemopoietic precursor cells in the presence of a variety of cytokines and medium supplements (4, 5). To elaborate on the correlation between differentiation stage and expression of Pgp and vaults that was found in MO-DC, we further evaluated their expression in CD34-derived DC and CML-derived DC. Immunocytochemical analyses showed that also in these cell types cellular differentiation/maturation, as reflected by up-regulated expression of CD1a and CD83, was accompanied by increased expression of Pgp and MVP (Table I⇓). Given its prominence in DC propagated from three different sources under different culture conditions, up-regulation of Pgp and vaults seems to reflect a common developmentally regulated event. Thus, in parallel to functional changes accompanying the differentiation from precursor cells and subsequent activation, as a response to danger-signaling agents present in the microenvironment (such as TNF-α and LPS), DC may rapidly up-regulate Pgp and vault expression. In chemotherapeutic treatment strategies, the induction or up-regulation of transmembrane transporter molecules, such as Pgp, in cancerous cells represents a major obstacle. In this view one might speculate that expression of the same MDR-related molecules by DC, known to literally scavenge their environment for potentially toxic materials, fulfills an evolutionary conserved defense mechanism that may also protect DC during chemotherapy. Therefore, we evaluated the functional activity of Pgp in fully mature MO-DC by investigating the efflux of the Pgp-transported fluorescent cytostatic drug DNR in the absence and presence of established Pgp inhibitors, PSC833 and VER (Fig. 2⇓A). Pgp-positive control SW-1573/2R160 tumor cells transported the substrate DNR into the surrounding medium, showing no retention as reflected by a decrease in mean fluorescence intensity down to the level of unloaded cells. This efflux was inhibited by PSC833 (DFI, 2.0) as well as VER (DFI, 1.8). Pgp-negative control SW-1573 tumor cells did not efflux DNR mediated by Pgp as was shown by full retention, which was not further affected by the Pgp antagonists. Also, in mature MO-DC, neither PSC833 nor VER affected the mean fluorescence intensity level (DFI, 1.0). MO-DC do not exhibit Pgp-mediated transmembrane transport. A, No effect of PSC833 and VER on efflux of DNR from LPS-matured MO-DC. SW-1573 (Pgp negative) and SW-1573/2R160) (Pgp positive) were included as control cell lines. Each graph shows the flow profiles of the measured fluorescence (on a log scale) in DNR-loaded cells (filled histograms) and unloaded cells (open histograms). Representative results of five independent analyses are shown. B, Lack of surface epitope detection of Pgp by the mAbs MRK-16, UIC2, 4.17, and 4E3 on viable mature (LPS) MO-DC compared with SW-1573/2R160-positive control cells. Each graph shows the flow profile of staining (on a log scale) conducted with specific mAbs (filled histograms) and isotypic control mAb (open histograms). Representative results of two independent analyses are shown. To verify whether, as suggested by these data, Pgp might not be expressed on the outer plasma cell membrane, we performed flow cytometric analysis on viable, mature DC using four different anti-Pgp mAbs (MRK16, UIC2, 4.17, and 4E3) directed against extracellular epitopes. Indeed, no immunoreactivity with surface Pgp was found on mature DC (Fig. 2⇑B). Thus, although Pgp could be detected by immunocytochemical and flow cytometric analyses using permeabilized MO-DC (Fig. 1⇑, A and B), no surface-exposed Pgp could be detected nor could Pgp-dependent trans-plasma membrane transport activity be shown. These results confirm those reported earlier by Randolph et al. (3), Chao et al. (27), and Laupeze et al. (28) in showing that DC cultured from MO do not exhibit Pgp-mediated trans-plasma membrane transport, but extend those data in revealing distinct intracytoplasmic Pgp expression. Importantly, in the former study extracellular epitopes of Pgp could be detected in epidermal skin-derived DC, as collected from human skin explant culture media, and were found to be functionally associated with their migratory capacity. This suggests that Pgp can be differentially expressed in DC depending on environmental conditions. Intracellular Pgp expression as well as inactive forms of Pgp have also been observed in tumor cells and in lymphocytes (29, 30, 31). Intracellularly, MO-DC-associated Pgp might still exert unknown functions in the vacuolar system, whereas on the cell surface Pgp might be expressed as a truncated product (32) and/or require functional activation through conformational changes under specific environmental conditions (33). Whether Pgp overexpression in DC may facilitate the release of proinflammatory mediators, like recently reported for another transmembrane transporter molecule, i.e., multidrug resistance protein (MRP1), is still unknown (34). The presence and function of vaults in DC have not been investigated before. To find clues as to a possible role for vaults in the functional and phenotypical development of DC, the subcellular localization of the MVP protein was studied in cytospin preparations of MO-derived immature and mature DC with the anti-MVP mouse mAb LRP-56 and MVP-9 using confocal laser scan microscopy (Fig. 3⇓). Similar to what was seen by conventional immunocytochemistry, a typical cytoplasmic, granular MVP staining was observed in immature DC and an even stronger MVP staining in mature DC. No distinct colocalization could be observed of the MVP protein with MHCII or MHCI, distributed along the pathways for presentation of exogenous and endogenous protein Ag, respectively (Fig. 3⇓A). Thus, no direct association with Ag presenting routes was revealed. Furthermore, the MVP protein did not colocalize with anti-TGN-46, specific for the trans-Golgi network (Fig. 3⇓A). Clear partial colocalization was found for MVP and CD63, a lysosomal marker (Fig. 3⇓B). Most likely, in the lysosomal degradative compartment the MVP protein, along with many other proteins, is ultimately destroyed. Subcellular localization of MVP in MO-DC. A, Separate subcellular distribution of MVP/vaults (g, green) and TGN, MHCII, or MHCI (r, red) in immature and mature (LPS) MO-DC. B, Partial colocalization of MVP/vaults (g) and the lysosomal marker CD63 (r) in LPS-matured MO-DC, indicated by arrows. Next, during both differentiation and LPS-induced maturation, MO-DC were cultured in the absence or continuous presence of anti-MVP polyclonal or an oligoclonal mix of three different anti-MVP mAbs or nonspecific control sera. Staining of the internalized Abs was conducted on cytospin preparations, applying only biotinylated secondary step reagent and the streptavidin-biotin-peroxidase complex. In all MO-DC cultured with Abs, cytoplasmic immunostaining was observed (Fig. 4⇓A), revealing uptake of the administered Abs, irrespective of their specificity, through their strong endocytotic capacity. Strikingly, the internalization of the anti-MVP polyclonal serum had a distinct effect on the phenotypic characteristics of MO-DC. When examining cytospin preparations, typically CD1a, CD86, CD83, and CD54 increased upon maturation. In contrast, MO-DC cultured with polyclonal anti-MVP showed reduced expression of each these markers in seven individual experiments as compared with the control cultures (Fig. 4⇓B). Along with this reduced expression of distinctive surface molecules, the addition of polyclonal anti-MVP during MO-DC culture led to a reduced viability of the mature MO-DC population when compared with cultures with control serum (Fig. 4⇓C; paired t test, p = 0.007, n = 7). MO-DC cultured with the anti-MVP mAb mixture also remained low in their expression of DC markers, but the slight decrease of viability under this condition did not reach statistical significance (Fig. 4⇓C; p = 0.310, n = 4). Culturing MO-DC in the presence of any of the individual, single-epitope confined, mouse anti-MVP mAb had no detectable effects on expression of costimulatory membrane molecules or viabilities (data not shown). Inhibitory effect of anti-MVP Abs on MO-DC maturation and induction of influenza virus-specific T cell responses. A, Immunocytochemical evaluation of internalized rabbit sera by antirabbit labeling only in immature and mature MO-DC. B, Immunocytochemical evaluation of MO-DC cultured in the presence of anti-MVP compared with control cultures showed reduced CD1a, CD86, CD83, and CD54 expression by mature MO-DC. C, Reduced viability (trypan blue exclusion) of mature MO-DC cultured in the presence of anti-MVP polyclonal antiserum (n = 7) and mAbs (n = 4) as compared with control cultures containing irrelevant control Abs. D, Result in C is reflected in concomitant reduced percentage of influenza virus-Ag-induced T cell proliferation by mature MO-DC cultured in the presence of anti-MVP polyclonal and monoclonal antisera as compared with control cultures containing irrelevant Abs (control median Ag-specific T cell proliferation index, 3.4, n = 7 and n = 4, respectively), as well as (in E) in reduced IFN-γ production (control median Ag-specific IFN-γ release, 165 pg/ml) under these conditions. After subsequent experiments with dextran-FITC were unsuccessful in revealing clear effects on intracellular uptake of exogenously administered Ag (data not shown), we explored the Ag-presenting capacities of mature MO-DC, generated in the presence of anti-MVP or control polyclonal Abs, respectively, anti-MVP, and control oligoclonal mAb mixes. When the respective DC were pulsed with influenza virus Ag and used to stimulate autologous T cells, highly significant suppression of resulting T cell responses was observed. This suppression was observed for both polyclonal and monoclonal anti-MVP Abs and revealed by both proliferation (paired t test, p < 0.001 for anti MVP polyclonal Abs (n = 7) and p = 0.003 (n = 4) for anti-MVP monoclonal mixture; Fig. 4⇑D) and IFN-γ release assays (paired t test, p = 0.001 for anti-MVP polyclonal and p = 0.005 for anti-MVP monoclonal mixture; Fig. 4⇑E). Thus, in the absence of gross effects on Ag uptake as reflected by intracellular dextran-FITC staining, the latter results support the view that intracellular targeting of vault particles with Abs binding the major vault protein interferes with appropriate handling and presentation of exogenously administered Ag. Interestingly, the lack of significant effects with the individual mAbs argues against interference with functionally relevant epitopes. Most likely, therefore, this blockade results from events secondary to this binding, e.g., from aggregation of vault particles. Taken together, we propose that vaults act as components in the cascade of events regulating DC effector function. Since their discovery, the occurrence and abundance of vaults in eukaryotic cells have argued for an important general function. From studies in the slime mold Dictyostelium discoideum, it is known that disruption of MVP results in a phenotype incapable of growing under nutritional stress (35). From studies in tumor cell lines, vaults have been implied in drug resistance (12, 15, 16, 36, 37). The present findings first demonstrate that, even more so than Pgp, vault particles are increased during the differentiation of DC and that their numbers are further increased upon maturation. An attractive hypothesis is that this reflects a fundamental response to stress signals and that in mature DC vaults may serve as protection of their integrity during migration to the draining lymph node. Whether this involves a nucleo-cytoplasmic shuttle of signal transduction (7, 14) or association with microtubular functions (9, 11) remains to be seen. The present findings point to a role of vaults in DC functioning, more specifically in their capacity to induce Ag-specific T cell proliferative and IFN-γ release responses. Obviously, future studies should also clarify whether vault particles might also play roles in other DC functions, e.g., migratory behavior and CTL activation. To further address all of these questions, we are currently developing MVP gene knockout mice. We thank Guus Rimmelzwaan for providing influenza viral Ag, Sinead Lougheed for technical assistance, and Jacques Neefjes and Mar Fernandes Borja for technical assistance and helpful advice regarding the confocal laser scan microscopy experiments, and for useful comments on this manuscript. ↵1 This work was financially supported by the Dutch Cancer Society, Grant VU 95-923. ↵3 Abbreviations used in this paper: DC, dendritic cell; CML, chronic myeloid leukemia; DFI, dye fluorescence index; DNR, daunorubicin; MDR, multidrug resistance; MFI, mean fluorescence index; MO, monocyte; MVP, major vault protein; Pgp, P-glycoprotein; VER, verapamil.